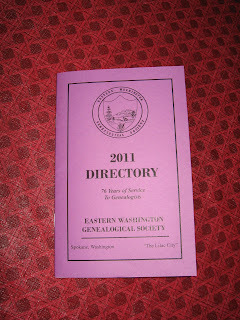 In today's mail, I received the brand new, lilac-covered 2011 Directory of EWGS members shown below. Every EWGS member will be receiving one in the mail very shortly. These are so handy to tuck in your genealogy notebook or your car when you're out and about working on EWGS projects! Directory editors Rod and Darlinda Ramer did an excellent job on this project, inputting countless hours of work and careful checking, and working alongside Membership Chair Pat Ewers to ensure that the directory was as accurate and up-to-date as possible. As a member, if you see an error in your information, please contact Pat as soon as possible, so that we can get the word out to other members. 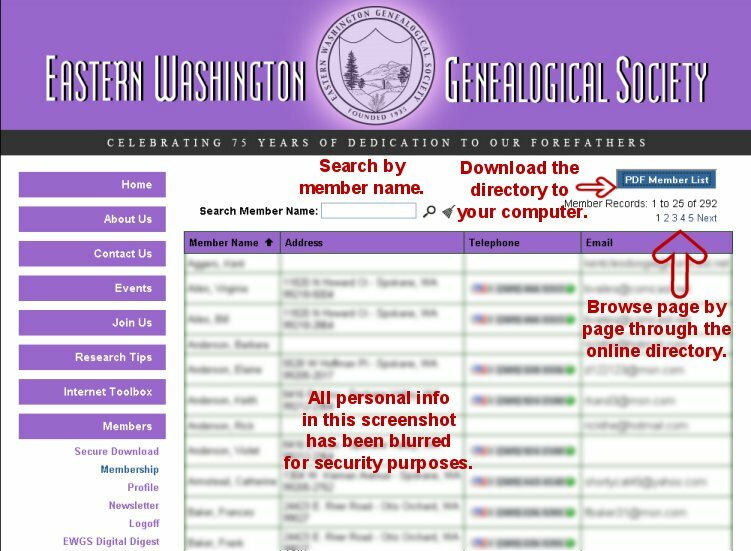 Also, if you are a member, you have access to the Membership Directory online on our website as well. This online information is private and secure, and only accessible to other members, not the public. 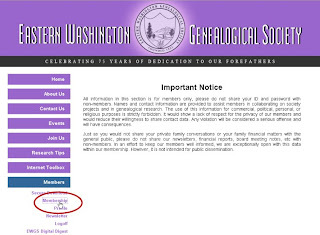 To access this information, go to the EWGS website, http://www.ewgsi.org, and click on the Members tab in the left hand column. Log in (if you don't know your login information, your user name is the first initial of your first name, plus your last name; in my case it is "mmidkiff". Your password is your five-digit zip code, and yes! you can change it to your own secret one later...I did!). After you login, you will see a small menu of choices under the Members tab in the left hand column. Click on the Membership link and you will be brought to a database of member names, addresses, e-mail addresses and phone numbers. 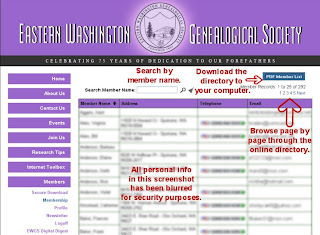 You can browse through this list alphabetically, search for a specific member's name, or download the list as a .pdf file to your computer. Thanks to webmaster Cecily Cone Kelly for all her hard work on our website! The flyer giving all the details about author Dan Lynch (Google Your Family Tree) is now posted to our EWGSI.org website! Thank you, Miriam, for doing all the leg work (and Maria for helping) and thank you, Cecily, for getting it posted. March and April are going to be banner learning months for EWGS! Donna Potter Phillips, Terri Merritt Rehmann, Cecily Cone Kelly and Margie Stein Beldin, all EWGS members, attended the RootsTech conference in February, 2011, in Salt Lake City. Next year perhaps the EWGS group photo will be of a larger group??? March 5th is before April 9th...... Do Both Now! This promises to be a fun and different day and hope to see all of you there. 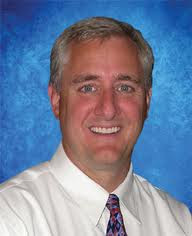 Hope you all are signed up to come learn how Google can help you with your research from Dan Lynch on Saturday, April 9th, SFCC Student Union Building, Conference Rooms A and B. Click to our website for registration details: http://www.ewgsi.org/events.php or download the flyer here. This is going to be a fabulous day of learning! 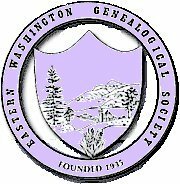 What Did I Learn At RootsTech To Help EWGS? 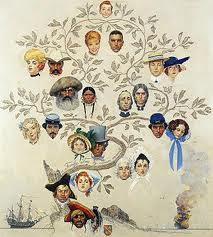 I learned that there are now at least three genealogy "worlds." 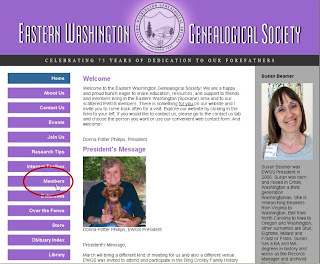 The first is the traditional genealogy world where folks occasionally visit libraries and attend meetings and now and then work on their genealogy. The online world is where folks actively do research both in libraries mortar-and-brick AND online and are comfortable with the many online resources. 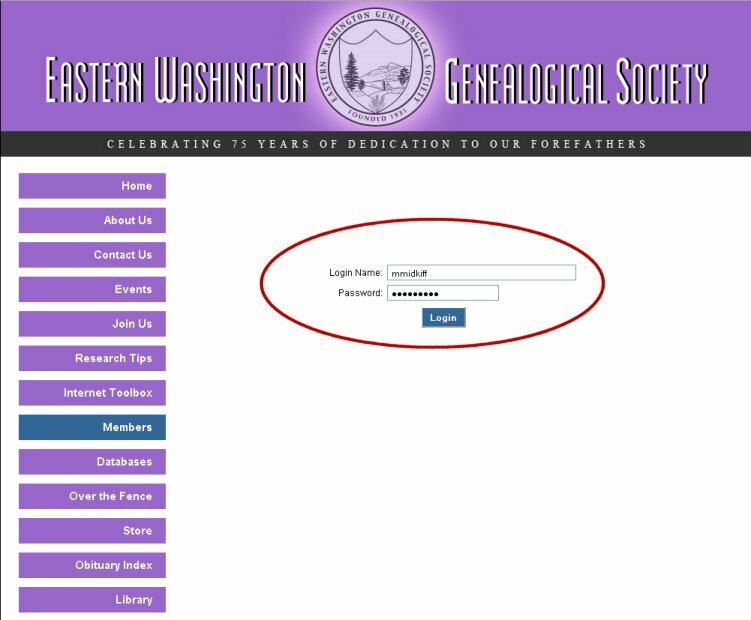 The technology genealogy world is where the really geeky genealogist uses some of the new toys as bonafide tools. So who and how many live in these various worlds? Randy Seaver in his Genea-Musings blog (13 Feb) was explaining this. He surmises that 85-95% live in the traditional world; maybe 5-15% live in the online world; and barely 2% live in the technology world. Nothing wrong at all in where YOU, dear EWGS reader, live. 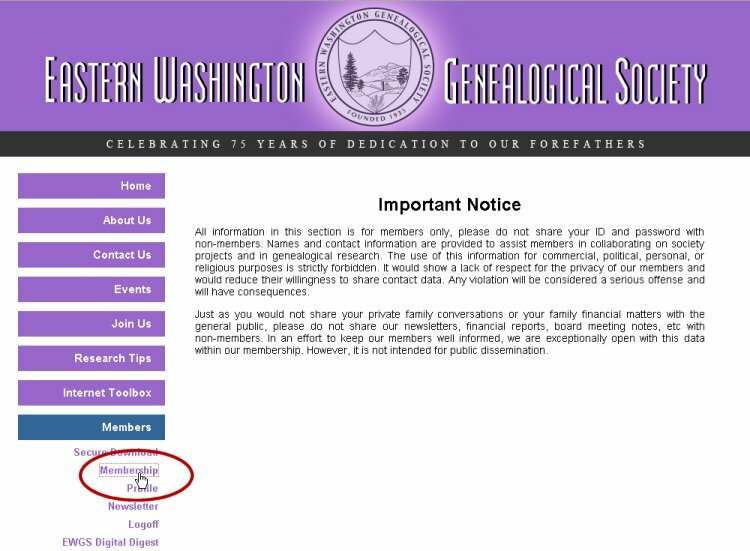 We are "genealogically born" into the traditional world. But if the statistics coming out of RootsTech are valid, folks everywhere are eagerly transitioning into the online world...one little step at a time. And that's just great. Just know this: that is where the future lies, where the most genealogy answers might/can be found, cheaper and quicker than ever before. Really, isn't that good news? RootsTech benefits me and EWGS. Being able to attend the first annual RootsTech conference is a wonderful learning experience. The #1 buzz word is collaboration. There are more and more ways for more and more ancestor seekers to connect both with each other, with other family and with the information they seek. Would you EWGS good folks like to learn about some of the resources that I've learned about?? 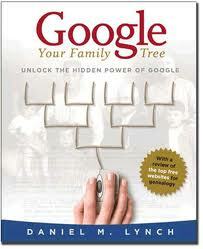 Here's a start: Click to www.familytech.familysearch.org ......... and learn about the new possibilities in your future!! 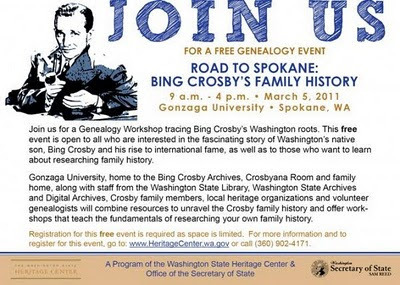 If you are a Legacy Family Tree genealogy software user, or are simply curious about this genealogy software program, you may be interested in the Legacy Users Group (LUG), which will meet next Wednesday, February 16th, from 1:30 to 3:30 PM in the meeting room of the Shadle Park Branch of the Spokane Public Library at 2111 W. Wellesley. This meeting is free and open to the public. Regular attendees will take turns in the role of moderator for each meeting. If you have more questions, please contact Donna Potter Phillips here. What does this wonderful Norman Rockwell's painting from an old Saturday Evening Post cover have to do with our new EWGSI website? Nothing and everything. Cecily Cone Kelly did a great job at the EWGS meeting on 5 Feb 2011 introducing and explaining our society's new website, EWGSI. I asked the folks, "what does the "I" stand for?" And they answered (correctly) for "incorporated." But not really, I said, "It stands for YOU-I-ME-EACH OF US as this website is unique and for each of us unique folks," just like those ancestors depicted in Rockwell's painting. 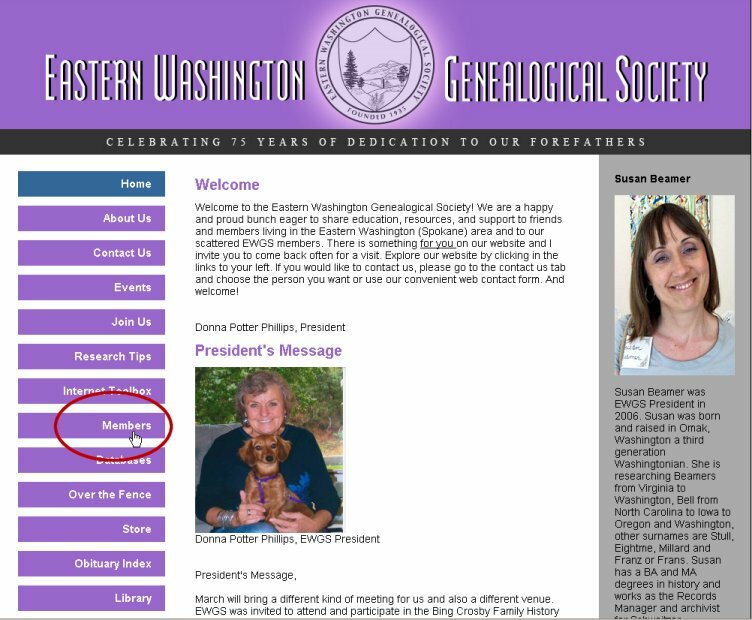 Our new website is designed and planned to give YOU, our EWGS members, more help, more answers and more information pointed towards doing more effective genealogy. Our EWGS-DD (catch that abbreviation for EWGS-Digital Digest) replaces our revered Bulletin and there will be a new "issue" posted quarterly. And where will the information come from to be in the EWGS-DD? Just like always: FROM YOU. 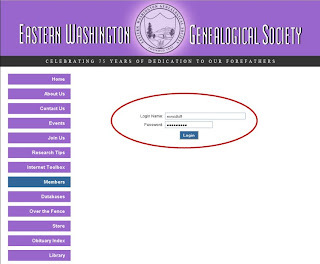 In the past you contributed stories, articles, and databases. We hope that you will continue doing this. Print-on-paper or print-on-digital, isn't it very much the same?? It is the content that matters. And our EWGS-DD and EWGSI website will have Gold-Plated, Wonderful content. Take a lookee for yourself. Thank you, Cecily, for opening our eyes to the vast possibilities of www.EWGSI.org.